A few days ago, Google published a useful tool to improve your website. 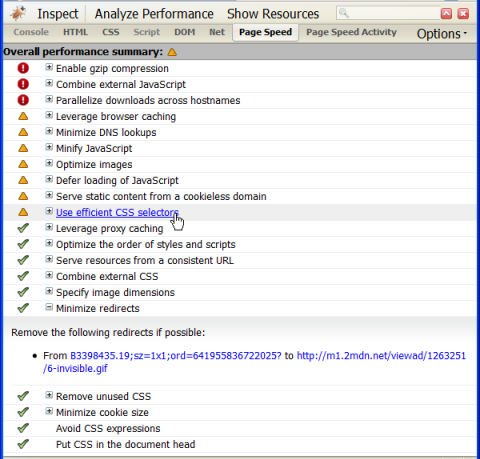 Page Speed is an open-source Firefox/Firebug Add-on. Webmasters and web developers can use Page Speed to evaluate the performance of their web pages and get suggestions on how to improve them. It is quite similar to YSlow and you also need the Firefox Add-On Firebug before you install Page Speed in Firefox. Here is a screenshot of an error report. Check out the Manual and Feature List of Page Speed. This sounds really intresting but main thinggy is that hope also realesed for google chrome! And what about YSlow [http://developer.yahoo.com/yslow/] ? I didn’t go more far away in the specificity of Google Page Speed [which abbr. is GPS, is it the wanted effect ? ^_^] but it seems YSlow proposes the same and maybe more, isn’t it ?